Advertise on SEOMASTERING.COM and present your message to the one of the largest search marketing communities on the Internet. This site performs very well in search engine rankings for posting terms and titles and can offer great SEO benefits for advertisers. Through various banners, sticky posts, and category advertising, you can reach your target audience efficiently. These advertising opportunities are beneficial in creating a wealth of exposure to your website and attracting key buyers to your service or product. Conversion rates are high because the traffic is targeted. From 9 000 to 12 000 daily visitors. More than 2 000 000 monthly page views. More than 3 million indexed pages. Here is seomastering.com site audit. Your banner file size should be less than 50 KB. About 100 000 indexed pages. About 1 000 000 monthly page views. Registered users can see forum stats here. 1) Top banner (728х90) on all forum pages - $60/month per position. 5 rotation positions. 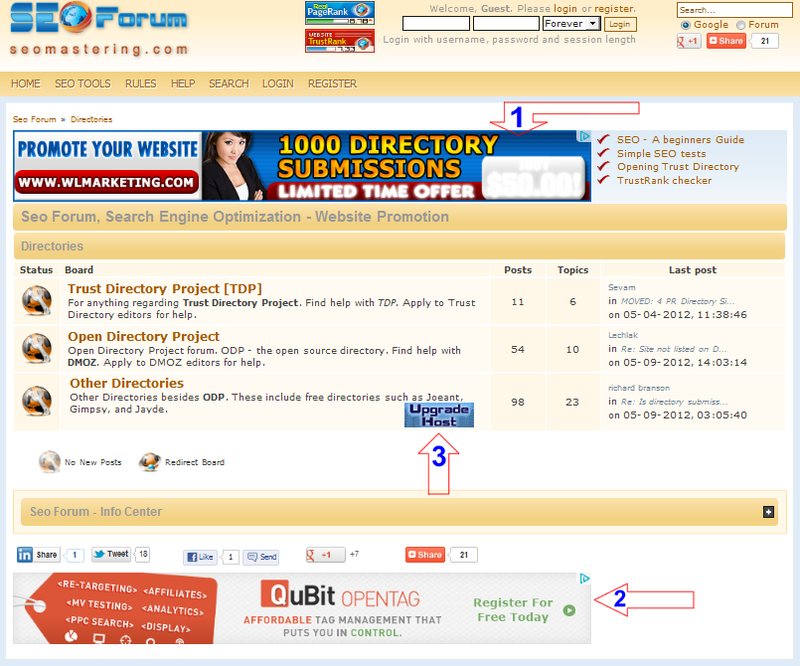 2) Bottom banner (728х90) on all forum pages - $40/month per position. 5 rotation positions. 3) Category Banner (88х31px), from main forum page through all category pages - $20/month. 3 months minimum payment. 4) Advertising board - $60/month. 5) Redirect board - $60/month. Note, 4 and 5 points can be created only as sub-boards. 6) Sticky Post - $20/month. 7 Banner after the first message on the all forum pages. 728х90 - $50/month per position. 5 rotation positions. Complex SEO Analysis tool (extremely popular), about 30 other SEO tools, 30 seo articles. More than two million audit pages and the same quantity of rating pages. Daily increasing and very popular part of the site. More than 1 000 000 monthly page views. More than 3 million indexed pages. 1) Top banner (728х90) on all pages - $90/month per position. 5 rotation positions. 2) Right-top banner (300х250) on all pages - $70/month per position. 5 rotation positions. 3) Right-bottom banner (300х250) on all pages - $50/month per position. 5 rotation positions. 4) Bottom banner (728х90) on all pages - $40/month per position. 5 rotation positions. 5) Button in the first block of the Complex SEO audit pages. 330х35 - $60/month per position. 4 rotation positions. 6) Advertising string ABOVE the first block of the seo audit pages. 35-45 letters - $60/month per position. 4 rotation positions. Payment via paypal or webmoney. To order an advertising slot please PM forum admin or contact us here. Page created in 2.322 seconds with 28 queries.